Two Jackson Police Officers graduate Basic Police School. 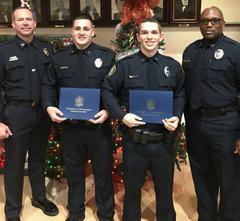 On December 20th, two officers of the Jackson Police Department graduated from Basic Police School at the Tennessee Law Enforcement Training Academy. Officers Hill and Tillett were members of Class 1855.